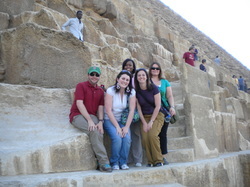 In December 2010, myself and four friends embarked on the journey of a lifetime to Egypt. Like my previous trips, we decided to go with Contiki for our adventure. As always, Contiki provided so much support and took care of pretty much everything for us. We were able to save quite a lot of money on the trip through special Contiki discounts such as the group discount, early payment discount, and having Contiki match our $200 deposit as we put our deposit down prior to the release of their new brochures. If you are debating whether or not you should do this trip, even with the current climate in Egypt, I truly believe that you should. It is honestly the trip of lifetime. Below is the description of the trip from the Contiki website followed by my day by day review of Contiki's Egypt & the Nile. Travel back in time to the days of the Pharoahs with this action packed trek around Egypt. You'll be guided through the craziness of Cairo with an expert Egyptian Tour Manager, who'll be at your side for the entire tour. 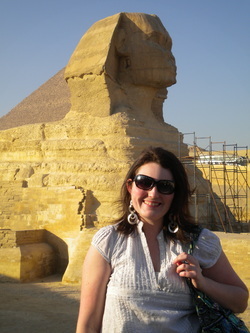 See the Great Pyramids & Sphinx in Giza & Valley of the Kings in Luxor. Sail on a traditional Felucca & enjoy shopping in the bazaar! No sitting on a coach for 8 days either - admire the scenery from the deck of your luxury cruise ship as you sail along the Nile. Step back in time & enjoy! 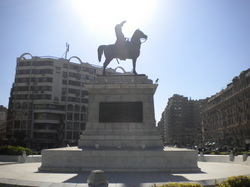 Day Two: Arrive Cairo:Check-in to your hotel and head out into Egypt's bustling capital for a taste of what's ahead. This evening, meet up with your Contiki Crew and fellow travellers at the hotel. 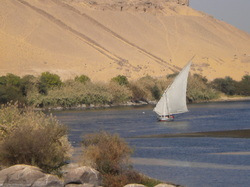 Day Four: Nile Cruise-Aswan: Pull into Egypt’s ancient frontier town of the south, Aswan. Relax into its laid-back African atmosphere, explore the colourful markets or walk along the Nile. Aswan gives us a look into Egyptian engineering, both ancient and modern. Opt to see Aswan and the unfinished Obelisk (stone pillar), Egypt’s single heaviest piece of rock weighing in at a mind-blowing 1168 tonnes, and learn how the ancients cut this mighty monument. You’ll also have the chance to visit the impressive High Dam, the country’s powerhouse for both irrigation and electricity. Later, you’ll hop on board a white-sailed felucca, a truly local experience. See the locals swimming, fishing & going about their day as you drift past. It’s a truly memorable way to see this unique part of the world & it’s the perfect way to relax, soak up some rays & chill. Afterward, it’s a chance for a bit of luxury as we board our cruise boat, where you can settle into your cabin and enjoy lunch onboard. This afternoon get a feel for a bit of the local lifestyle. Slowly rummage through the Aswan souk (market), full of fragrant spices, amulets, textiles and souvenirs. Try some hibiscus tea or snack on tahini (sesame dip) and daoud basha (meatballs in tomato sauce). Tonight, get together with some of your travel buddies and unwind with a drink at the boat’s bar. Day Five: Nile Cruise-Aswan to Edfu: Kick the morning off with an optional excursion to Abu Simbel, another stunning UNESCO World Heritage site. Fly over the vast desert and one of the world’s biggest man-made lakes, Lake Nasser. Let your jaw-drop as you gape at this overwhelming structure and get the real story on Ramses II from our expert Local Guide. This afternoon, relax on the cruise while floating down the palm-lined Nile River, past timeless monuments, green fields and the Arabian desert. The boat has even got a pool. So pull up a lounge chair, soak up some sun and write a few post-cards. 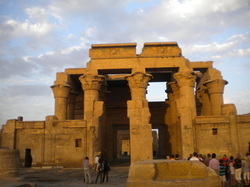 Next up is Kom Ombo, once a busy trading point for gold and elephants. See the town’s unique riverside temple, famous for being perfectly symmetrical and for being shared by two gods. 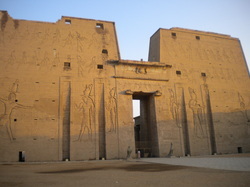 Tonight we dock in Edfu. Day Six: Nile Cruise-Edfu to Luxor: If you’re feeling up for it, there’s your chance to visit Egypt’s second largest and best-preserved temple, the Temple of Horus the Avenger. Here you can learn about the gods’ history of hostilities, how offerings were made to them and the overall importance of this fascinating Graeco-Roman temple.Cast off and watch Upper Egypt slip away as we cruise to our next port of call, Majestic Luxor – site of the ancient city of Thebes.Day Seven: Luxor: Be amazed by the sheer volume of famous monuments around Luxor, often referred to as ‘the world’s greatest open-air museum’ it’s all about indulging in a cultural feast today. Across the Nile for a closer look at the Colossos of Memnon, the large scale remains of a once massive temple. Towering above the landscape at 18 metres high, these gigantic stone statues will make your jaw drop. After a visit to the Hatshepsut Temple it’s time to experience the afterlife and the city of the dead with our included tour of the Valley of the Kings. This spectacular site is where Tutankhamen is buried and where you’ll visit some of the 63 royal tombs - you’ll get a real insiders look & some essential knowledge that only a local can give, on a guided tour with our Egyptian expert. There’s also the option to work your way through the stunning Temple of Karnak – an enormous 2 sq km site crammed full of remains, obelisks and sanctuaries, including the world’s largest religious structure, the Temple of Amun. Our Local Guide takes the group through the monumental timeline, which almost every Pharaoh added to during his reign. 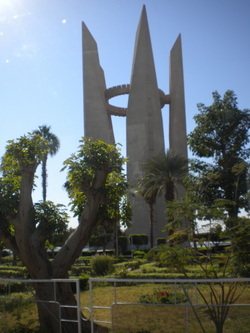 Later, we’ll say farewell to Luxor & before heading to beachside Hurghada for some chill out time in the sun. Maybe do some shopping, sun seek at the beach & top up your tan or get into some watersports. Tonight, ask your Tour Manager for some tips on where’s good to head to & get into the city’s many bars, restaurants & cool nightlife. Day Eight: Cairo: On arrival, make the most of your last night in Egypt -- get into some shopping if you feel like something different & dive right into the heart of old Cairo – you could visit to the ancient Khan El Khalili bazaar for a truly local experience. Maybe find somewhere for some mouth-watering mezzes (plate sized nibbles), Egyptian bread and hummus dip or sip on some shai (tea).Top off your trip with an optional Sound and Light Show and enjoy a final look at the amazing pyramids all lit up. Make the most of your last night and head out with the group into Cairo’s buzzing nightlife. As the sun goes down, people pack the streets, drink coffee and head to their favourite local bars, so get out there among them for a last slice of Egypt. We arrived in Cairo around 7pm local time. The group that I went to Egypt with came in small groups to Cairo, but 3 of us were able to meet up at the airport. When you get off your plane you will walk through a long hall that will eventually lead you to customs. I thought that the Contiki Rep that meets you ate the airport, would be waiting right outside where we got off the plane, but they actually meet you after customs in the luggage area, so don't be alarmed if you do not see them right away. When you get to the customs area, if you haven't gotten a visa yet, you can get one at the bank stands that surround customs. To get a visa, it cost $15 and then I was lucky enough to convince one of the workers to break my money into smaller bills. This will be VERY important for later on down the road as we continually ran into issues of not being able to get small bills. The Contiki Rep took us from the airport to the hotel which was wonderful as I have no clue how else I would have made it to the hotel. We stayed at the Victoria Hotel. 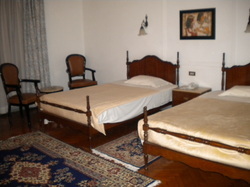 The hotel is a little older, but the rooms were very spacious. The bathrooms were a little small and several people on tour had issues with not having hot water, but overall, the hotel was fine. The elevators are incredibly scary though and the stairs are quite a workout if you are on higher levels. The hotel has a lovely lobby area where we gathered for our pre tour meeting as well as a restaurant, bar, and outdoor patio which includes a small internet cafe. It was very loud outside of the hotel and you could hear the prayers on speakers throughout the day/night. You should expect to start tipping people as soon as you get to Egypt, as we had to tip both the driver and our porter when we arrived. Below is a picture of my room in the hotel. Our first night, we did decide to venture out and find some food. 3 of the 5 from our group had arrived and we met another member of out tour group, Andre, on the ride over to the hotel so the four of us went out to find food. 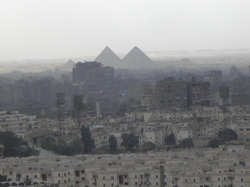 As a side note, we did arrive in Cairo a day early so that we could get settled before the tour started. We wandered around for a little while before finding a populated street and choosing a restaurant. At the restaurant we had a traditional Egyptian meal of a mixed grill with rice, chicken, lamb, and other assorted meats. The dinner was absolutely delicious and the service was incredible. We paid 75 pounds for the meal, which was roughly $12. The next morning, I woke up at 5am with the bullhorn going off with the morning prayer. I ended up being jet lagged and was awake from 5am-8am. When I finally got up, I met up with the rest of our group and got breakfast at the hotel. the hotel offers this every morning, so its really good to take advantage of it. Our group ended up leaving the hotel around 11am to start exploring Cairo. We honestly had no idea where we were going, we just wanted to see the city. We headed in what we thought was the direction of the museum passing a statue of Ibrahim and one of the Egyptian palaces. Cairo is an incredibly dirty city. Part of it is the sand and dust that is Egypt, but there are hundreds and hundreds of abandoned vehicles throughout the city. We ended up in the "real" Cairo and not the touristy area which, in my opinion, was an incredible experience because we got to see what Egyptian life actually is. The people were very friendly and you could tell the area we were in probably didn't ever get tourists because everyone stopped to look at us as we passed by. Crossing the street is very difficult and dangerous in Cairo...you just have to run for it and hope you make it to the other side, so be aware of that. We ended up going back to the hotel for lunch where most of us had omelets and fries. Lunch was around 32 pounds. That evening we had a pre tour meeting in the hotel lobby. THIS IS A VERY IMPORTANT MEETING, so do your best not to miss it. Our Tour ended up having 70 people on it. This is very unusual for the Egypt tours as they typically have around 20-25 people. Because of the large number, our group was actually split into two separate tours. For the Egypt Tour, you can put optional excursions on your credit card and there are several that you need to pay for the first night including Abu Simbel and the pyramid light show. I ended up putting $267 on my credit card for optionals and then paying another 50 pounds in cash for optionals/tips. After the meeting most of the group left to go get snacks and dinner I spent 15 pounds on snacks and got an amazing falafel and fries for 5 pounds. We then went back to the hotel, had some wine (24 pounds) and got to know some more of out tour group. Our first official day on tour started incredible early as we were up at 5:30am. We had a continental breakfast at the hotel which included rolls, cheese, fruit, eggs, jams, tea and coffee. Our group left the hotel at 8am and headed straight to the Egyptian Museum. The Museum ticket was included and it was the first of many tickets that we would receive. Unfortunately, you cannot take cameras inside the museum, so be sure to leave yours on the bus. The museum is so impressive and they have so many artifacts that they can;t display all, so at the time of our tour, Egypt was working to gain the funding to build a new, bigger museum. The downstairs of the museum is separated by kingdom and is mostly filled with statues and paintings. Our tour guide, Sherif, took us around the museum and did a great job explaining the history of Egypt as well as what we were seeing. On the second floor of the museum are all the items that were found in King Tut's tomb including the absolutely breathtaking famous mask. We spent about 2 hours in the museum, one hour being guided by Sherif and the other being our time to explore. For an additional 100 pounds, you could buy a ticket to go into the mummy room, our group chose not to do that and instead explored Tut's treasures, different coffins around the museum, and went into the animal mummy room. The second part of the day was spent in Giza at the pyramids. We started our visit at the Great Pyramid where we were able to climb on part of it (see first picture above). We were given roughly half an hour to spend at the Great Pyramid and get to the second pyramid. Being at the pyramids and seeing something that is thousands of years old is absolutely breathtaking and is part of the reason this trip is so incredible. You have the option to go inside the third and smallest pyramid for an additional 30 pounds. Several people in our group did chose to do this. You will find that there are lots of vendors around the pyramids. You can haggle with them, but be careful in your dealings with them as they may try to trick you by saying a price in Egyptian pounds and then when you go to pay telling you its actually in British pounds. Also, don't take pictures of the people on camels, they will expect for you to pay them for these pictures. After spending time at all of the pyramids, our group did a camel caravan in the desert that led us right in front of the pyramids. This is a must do as it is an experience you won't get anywhere else. They camel caravan cost 90 pounds. We also ended up having our group picture taken by the pyramids. We were then given 30 mins at the third pyramid before heading to the Sphinx. At the Sphinx we got 45 minutes to walk around and take pictures. It was very interesting, but a little disappointing as they did have some scaffolding up on the Sphinx. While at the Sphinx, I decide to buy some items from vendors including a set of pyramids for $1 and a scarf for 40 pounds. After our time at the pyramids, we left and got a late lunch at Fel Fela which is a traditional Egyptian restaurant. 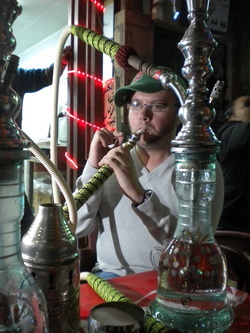 This cost 60 pounds and was absolutely delicious with several courses of traditional Egyptian food. 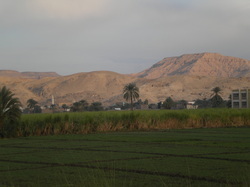 We then headed to the train station to get the overnight train to Aswan. The overnight train compartments are tiny and are not made for large suitcases, so be kind to your fellow travelers and try to pack lightly. There is a steward who looks after every compartment (brings food, puts down beds, etc). The room included seats that converted into bunk beds as well as a small sink with a mirror and outlet. The train was slightly rocky but not awful. There is one club car on the train where you can bring alcohol and hang out, most of the group ended up doing this. It does smell of smoke though. There are also 2 small bathrooms per car which include a sink and toilet. You do not get to shower on the train and its a little gross. I chose not to eat the food they brought for dinner and ended up going to bed early. The train did end up jerking to a stop about every hour and waking me up a lot throughout the night. Overall the train was not an enjoyable experience. 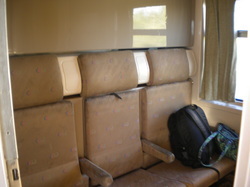 Below is a picture of the train compartment. We started our next day by visiting the unfinished obelisk and stone quarry where we got to hear more history. We were there for about half an hour. We then drove through the local area of Aswan and it was wonderful to see the local culture. Aswan is an area full of nubians, so you see darker skinned people in the Aswan area. Our second stop of the day was at the old dam otherwise known as the British Dam. Following that we went to the Aswan High Dam which was very impressive as we got to see the Lotus memorial and Lake Nassar. We also ran into the French President there. Following the dams, we took a boat over to the botanical gardens. These were absolutely beautiful. The boat ride was amazing, the scenery was incredible, and the botanical gardens were beautiful. Take the time to appreciate this stop. After our time in the gardens we were treated with a Feluca ride. This is another incredible part of the trip and the weather was just perfect for this. 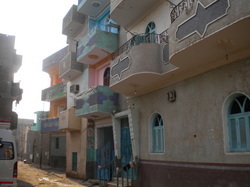 On the ride back we saw Egyptian tombs in the desert and some beautiful Egyptian homes. Following our busy day, we finally got on our boat for our Nile Cruise. Don't expect a cruise ship as these boats are floating hotels. The rooms are HUGE...way bigger than normal cruise ship size rooms. Our boat had a bar/dance area, large buffet restaurant, gift shops, and a great sundeck/pool area. There is internet on the boat, but it is very slow. You can also make international calls from the boat. The small gift shop had cartouche necklaces available starting at $35, so I did end up getting one of those. All meals were served in the buffet on the boat. After dinner, we left the boat and headed back into town. Our first stop was at a perfume shop where we learned about how Egyptian's make perfume. This is one of Contiki's sponsored shops, but it was a really nice store and almost all of us ended up buying something. Perfume started at $35. 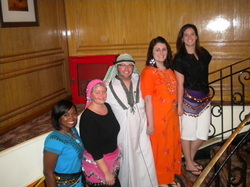 We then headed to the market to purchase clothing for the Egyptian night we were going to have on the boat. Again this was a place were you could haggle, which sometimes got a little overwhelming. I got frustrated at one point and left a store only to have the salesperson come running out after me. When we got back to the boat we had a night of Egyptian entertainment with a belly dancer and a man who was great at spinning. We spent the rest of the night drinking and getting to know more people in the group. Today was the earliest that we had to get up as those people on the tour who were going to Abu Simbel got a lovely 3am wake up call. To get to Abu Simbel we had to take a flight. We flew with Air Memphis and were able to sit anywhere on the flight. It was a regular flight with about 150 seats. We arrived at Abu Simbel right at sunrise which was wonderful. We got there before a lot of the other tour groups and Sherif shared with us the amazing history of Abu Simbel. If you go to Egypt, you HAVE to go to Abu Simbel. With Contiki, it is an expensive optional, but it is worth every single penny you will pay, so do not miss out on it. We were given an hour and a half to visit both of the temples there. Again, we could not take pictures inside which was very disappointing, but you could buy a booklet with pictures for 20 pounds. 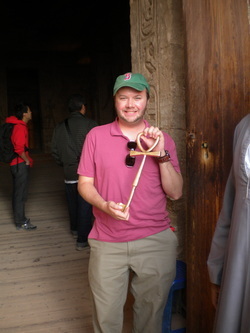 You are also able to tip one of the locals and they will let you take a picture holding the key to one of the temples (see picture below). The first known animation is also inside the main temple and it is also absolutely mind blowing and incredible. Take the time to explore the temples and appreciate the magnificent story of them. We arrived back from Abu Simbel around 10:30am and chose to spend some time on the upper deck laying out before lunch. I highly recommend that your bring a bathing suit with you on the trip for the boat cruise. Around 4pm we arrive at the Kom Ombo Temple which is the temple of two gods...the crocodile (evil) and sobek (good). We got to the temple right before sunset and again managed to beat most of the crowds, though it did get crowded fast. This temple was one of my favorites as it was just spectacular and it had the only painting of Cleopatra in it. This temple had a lot to do with medicine, so you saw in the wall etchings/paintings things related to medicine which was incredible. There is also a window in this temple where people could come and speak to the gods. We were given plenty of time to explore the temple and then stroll through the markets on the way to the boat. The people at these markets were very very pushy and was filled with lots of children trying to sell items. After visiting the temple we headed back to the boat for our Egyptian night. The buffet all traditional Egyptian food, but I really was not a fan of what they had. After dinner we all got into our Egyptian outfits and headed down for the Egyptian party which was full of dancing and drinking and was a ton of fun for the entire group. Lots of people stayed up all night long and it was an overall great night. We had another early wake up call, but this time at 6am. Our first stop of the day was the Edfu Temple which is the temple to Horace who is the falcon god. This temple once had a pharmacy in it and when you enter the room that used to be a pharmacy you see hieroglyphics that are related to medicine. 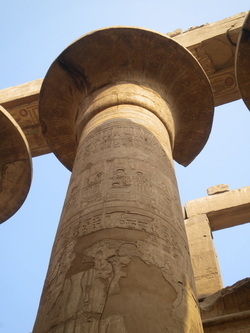 Throughout the entire temple are gorgeous hieroglyphics which will amaze you. This temple was taken over by Christians during the Roman time and the Christians ended up chiseling out a lot of the hands, feet, and faces of the etchings. Again there was a market outside this temple. After visiting the temple we had several hours on the boat as we headed up to Luxor. We spent more time on the top deck relaxing as we sailed the Nile. 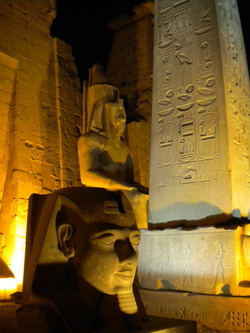 When we arrived in Luxor, our first stop was the Luxor temple. 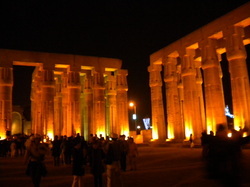 At this point it was night time, but the Luxor temple has amazing lighting that illuminates the temple at night. There is a beautiful obelisk in front of the temple and a walkway of sphinxes. Today, they are still uncovering sphinxes in the city as they excavate more. There are markings of Alexander the Great in this temple and part of it was plastered over by Romans. Following our visit to the temple, we headed to a papyrus store for a demonstration on how papyrus is made and to purchase papyrus paintings. It was really neat to see the process and then be able to look at some of the amazing pieces the store had. Again, this was another Contiki sponsored store. Pictures start at 60 pounds. I recommend that you save money for this visit as you should take a piece of Egypt home with you. I ended up getting 4 different items in the store. Yet another early morning, as we were up at 5:30am to head to the Valley of the Kings. 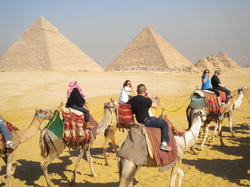 Included in the ticket is a visit to 3 tombs. You can pay an additional 50 pounds to go into Ramses VI tomb and then an additional 100 pounds to go into King Tut's tomb. 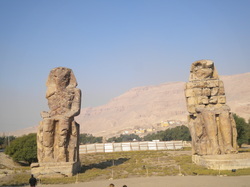 I ended up only doing the three included ones, so I saw Rameses I, Thutmes III (which was the first tomb built) and Rameses IV (first tomb discovered). These tombs are over 3500 years old. the last tomb was found 4 years ago and they are still excavating today. The first tomb we visited, Rameses I, was an absolutely stunning tomb whose paintings and colors were still so vibrant. The second tomb was located very far from the others and was a little bit of a hike to get to. It was also a little dangerous to walk in and if you are claustrophobic, I don't recommend that as a tomb to go into. But it was neat with two different levels and a local showed some extra things in the tomb to myself and a friend. The last tomb was also very beautiful but had lots of stairs we had to climb down. There was also a lot of wind that morning so we kept getting dust and sand blown into our faces. This was yet another site that you could not take pictures at which was very disappointing. Following the Valley of the Tombs we made a quick stop at the colossus of memnon before heading to Kornak Temple. We then headed to the Kornak Temple which may have been the most impressive temple we saw as it had several obelisks and beautiful lotus columns as well as lots of other interesting finds. 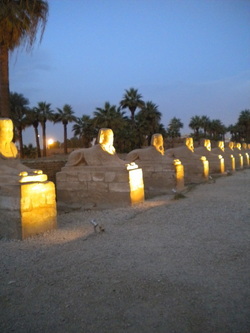 There were more sphinxes here as originally the lane of sphinxes went from the Luxor Temple all the way to Kornak. In the temple is a statue of a scarab that legend says, will grant wishes. You are to talk around 7 times and you can think of the same wish every time, or you can do a different wish for each time you walk around it. So of course, we chose to do this. After visiting the temple, Contiki arranged for us to have lunch on another boat and have showers which was great as we were getting on the lovely train again. We spent the afternoon exploring an Egyptian Village and to get to the village we had three modes of transportation...you could either ride a donkey, ride on a donkey cart, or on a camel. 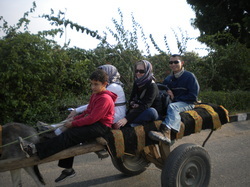 I chose the donkey cart which was an experience. This is another must do optional on the trip. One of the girls in our group said it perfectly..."people come to see Egypt as it was, not how it is" by doing the Egyptian village tour you get to see the real Egypt and hear from Egyptians what their lives are like. It was an eye opening experience and one that I appreciate. Most of the people we saw in the village didn't wear shoes and the children were excited to see all of us, though some of them did not want their pictures take. 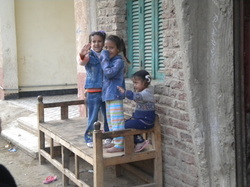 We learned about culture and got to see inside an Egyptian house. After the village, and before heading back to the train, we went to McDonalds for dinner and then got back on the train and literally had a party all night long before getting back into Cairo. 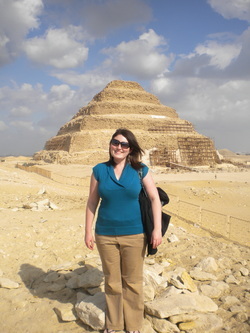 We finished our tour back in Cairo and started the day by heading to the oldest pyramid, the Step Pyramid. We were given plenty of time to wander around the pyramid and the other tombs in the area. Unfortunately, the pyramid had scaffolding on it. 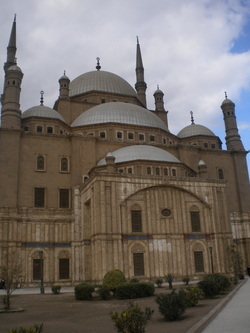 After the Step Pyramid we headed to the Citadel in Cairo which is the largest mosque in Cairo. Sherif spent time teaching us and showing us how Muslims pray and get ready to pray. We spent time looking around the citadel and got an amazing view of the city. This was really interesting to learn and see. 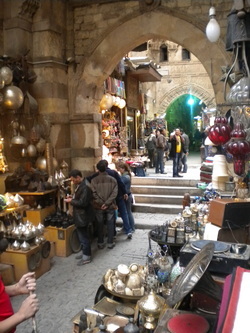 We then spent a majority of the afternoon shopping in the markets of the famous Khan El Khalili. Save some money for this as you can find some great stuff in the market. It is very easy to get lost though so make sure you pay attention to where you are going. After the market, we headed back to the hotel and said our goodbyes to Sherif. Some of us in the group made the decision to go to the light show at the pyramids. It was very cheesey, but it was nice to see the pyramids at night. It was also New Year's Eve, so many people from the tour headed to New Year's parties throughout the city. Overall, this trip was absolutely spectacular and I highly recommend to anyone who is considering it. I exchanged $200 before I left which gave me plenty of money to get through the trip. I used my credit a few times on the trip. Make sure you get sleep...its a lot of early mornings and you don't want to miss anything! 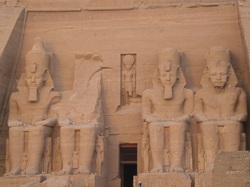 GO TO ABU SIMBEL...seriously...don't miss out on this!